Trends: Trends are defined technical conditions that are then displayed as a ribbon on the bottom of the security. Ultimately, they provide a convenient way to view bullish, bearish, and neutral zones of a security. Commentary: The Commentary is perhaps the most powerful of the five components. It allows us to write text and then control how the text is displayed based on logical conditions. This information is then presented in a separate window. When we examine this further, its usefulness will become apparent. Highlights: Highlights change the colour of the price bars depending on defined technical conditions. Symbols: Symbols are placed either above or below the price plot depending on defined technical conditions. These are similar to Highlights, with the only difference being the way in which the conditions are displayed, i.e. symbols are used instead of changing the colouring of bars. 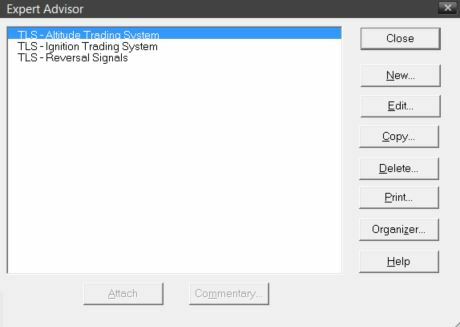 Alerts: Alerts place small pop-up boxes over the security’s chart alerting us when certain defined technical conditions are met. These are similar to Highlights and Symbols in that they alert you to the existence of certain technical conditions. 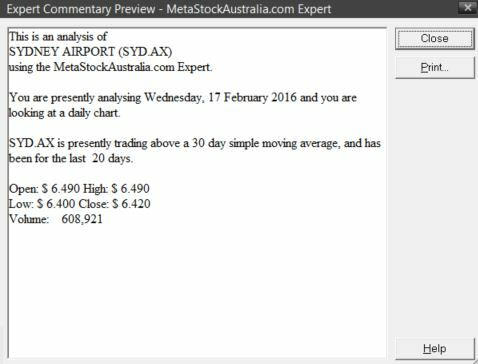 These five simple yet effective components make up The Expert Advisor and greatly assist in analysis of charts. Their effectiveness is based on the fact that human beings are sensory creatures. That is to say, we love to ‘see’ things in order to achieve greater understanding. Generally we are not satisfied with just reading something to understand it; rather we prefer seeing it with our own eyes. Herein lies the power of The Expert Advisor. By using these five components, we are able to change the colour of price bars, place Symbols on the chart, lay coloured ribbons to depict the trend, and have this accompanied by limitless amounts of technical analysis commentary. Close: Closes the Expert Advisor dialog. 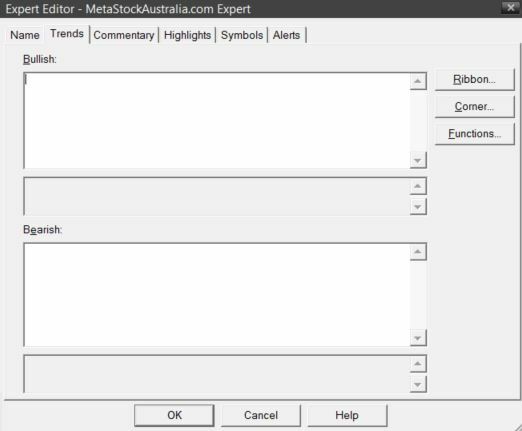 New: Displays the ‘Expert Advisor Editor’ dialog, allowing you to name and create a new expert advisor. 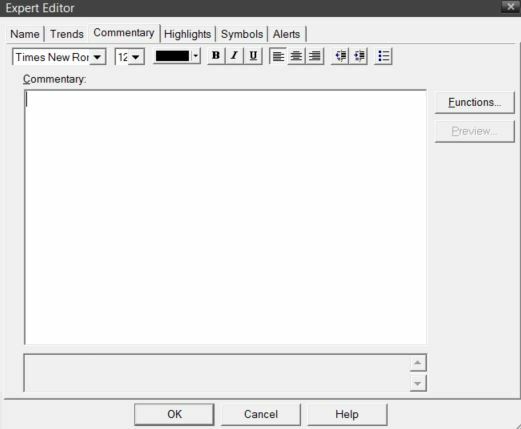 Edit: Displays the ‘Expert Advisor Editor’ dialog of the selected expert advisor, allowing you to change the name or the formula of The Expert Advisor. Copy: Copies the selected ‘Expert Advisor’, allowing you to rename it and change the original expert advisor. Delete: Deletes the selected expert advisor. Print: This will print the details of the selected expert advisor or all expert advisors to include all the names or the names and formulas for them. Organizer: Displays the ‘Formula Organizer Wizard’ and enable you to import or export formulas from any of the four main formula using tools within MetaStock. Help: Displays the built in Help Feature. Notice the six tabs across the top of the window. The first one is labelled ‘Name’ and the remaining five are the five central components to The Expert Advisor. Let’s start with the ‘Name’ page; here we are presented with the two separate text boxes allowing us to insert information. The top one is the ‘Name’ box and obviously this is where we ‘Name’ our expert advisor. We are going to call this expert the ‘MetaStockAustralia.com Expert’. Below this is the notes section; remember, any information entered into this text box does not affect the operation of The Expert Advisor. 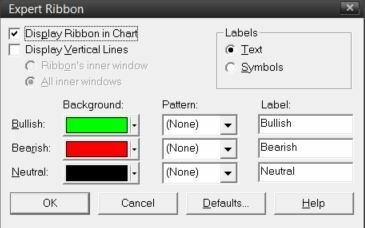 From within this dialog, we can change the colour of the bullish, bearish and neutral ribbon. Furthermore, we can label this ribbon with either text or Symbols. Within this dialog there is one more option to note, the ‘display vertical lines’ option. This allows you to place vertical lines on the chart at the points where the trend ribbon changes status, e.g. from bullish to bearish. Within the Trends tab, we can also place a symbol in The Expert Corner. This area is located at the bottom right hand corner of the chart. Basically, this enables us to quickly identify which conditions exist at present, i.e. bullish, bearish, or neutral. To activate these Symbols, click the ‘Corner’ button and tick the check box ‘Display Symbol In Expert Corner’. 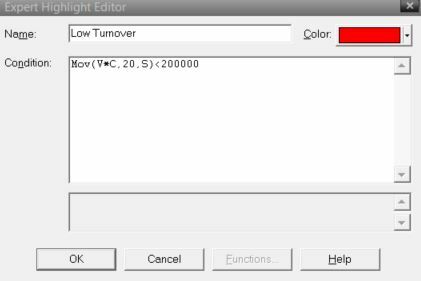 Additionally, within this dialog, you can change the Symbols and select their colours. In our example we’ll leave these set to default. The Commentary is the most complex component of The Expert Advisor. Within this component we can use MetaStock’s powerful formula language to its full potential. In essence the Commentary is just a text report of analysis conducted on the chart. To begin, re-open our newly created Expert Advisor. 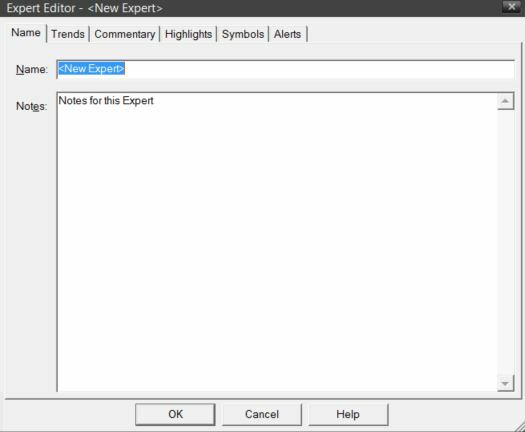 To edit any Expert Advisor you can click on The Expert Advisor icon in the standard toolbar; select it via the Tools menu; or right mouse click on the chart’s background and select ‘Expert Properties’ under Expert Advisor. This last option will only allow you to edit the Expert Advisor currently attached to the chart you are viewing. <Name> Displays the name of the security that The Expert Advisor is analysing. <Symbol> Displays the code for the security (i.e. ASX code). <Periodicity> Displays the periodicity of the chart that The Expert Advisor is analysing, eg. daily, weekly, monthly etc. Note that if you append ‘:S’, making the syntax <periodicity:s>, then the words day, week, month etc. will be used instead. Your choice will depend on the context in which it is being used. <Date> Displays the date that The Expert Advisor is analysing. Similarly to the periodicity, there are two options for displaying the date. Appending ‘:L’ to the syntax, making it <Date:L>, will display the date in long format, e.g. ‘Friday, April 1, 2016’. The short format, which is shown by not including the ‘:L’, is displayed as ‘1/04/2016’. <Expert> Displays the name of the expert being used. You are presently analysing <date:l> and you are looking at a <periodicity> chart. The ‘writeif’ function allows us to display one of two different text options, depending on whether an expression is true or not. That is, if the expression is true, the first text string is displayed, however if the expression is false, the second text string is displayed. The astute reader may notice that this is simply a variation on the ‘if’ function. <symbol> is presently trading writeif(C> Mov(C,30,s),”above”,”below”) a 30 <periodicity:s> simple moving average, and has been for the last writeif(C>Mov(C,30,s), “writeval((BarsSince(Cross(C,Mov(C,30,s)))),3.0)”, “writeval((BarsSince(Cross(Mov(C,30,s),C))),3.0)”) <periodicity:s>s. X = The maximum number of characters to be used for the number. Y = The number of decimal places to be used. Using this information, we can now place the open, high, low, close and volume data into our Commentary. Notice for all these prices, we have limited them to 3 decimal places. The only exception was the volume where we have specified a whole number by using the syntax ‘writeval(V,10.0)’. Basically, these buttons allow us to modify the appearance of the text in our Commentary. We can alter everything from the fonts used to their colours. Using the formatting tools allows our Commentary to come alive and will add value to our analysis. For example, in Commentary we could have the words ‘above’, ‘higher than’, and ‘increased’ all in bold green text while their opposites could all be in bold red. These simple changes will add a new effectiveness to any Commentary. This formula identifies when a security’s turnover is less than $200,000. Since we consider this condition as negative, let’s change the colour of the Highlight to red. Theoretically, you can place an infinite number of Highlights within the same expert. You can then rank these in the order of importance. To do this simply use the up and down arrows to rank the Highlight as you wish. The reason we must rank our Highlights is because two Highlights cannot be applied to the same chart at once. If two conditions occur for the same period, the Highlight that ranks higher will take precedence and be applied. There is one more important point to note; there is a check box to the left of the Highlight name which allows us to literally turn on or off individual Highlights. This avoids the need to delete them. We can simply activate, or deactivate, them as we wish. Within the ‘Expert Symbol Editor’ dialog, there is also a ‘Graphic’ tab. Within this tab, we can select the Symbol that will be used when the technical condition is met. Moreover, we can also decide on its size, colour and any label that appears. 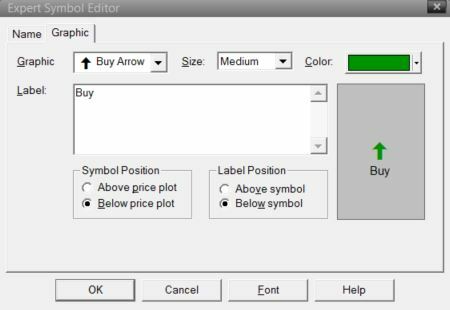 In the case of our expert advisor, we have selected a medium size, buy arrow and have labelled it with ‘Buy’. The label and symbol shall be positioned below the price plot. Similar to the Highlights, we can place an infinite number of Symbols; however, remember that if two conditions occur at the same time the Symbol that ranks higher will take precedence and be applied to the chart. We have now completed four of the five comonents within our expert advisor; let’s apply this to a chart to review our progress. 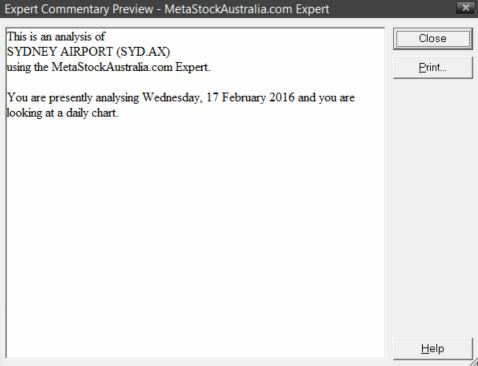 Close the ‘Expert Symbol Editor’ and the ‘Expert Editor’ dialog, and then attach our new expert advisor to the chart. 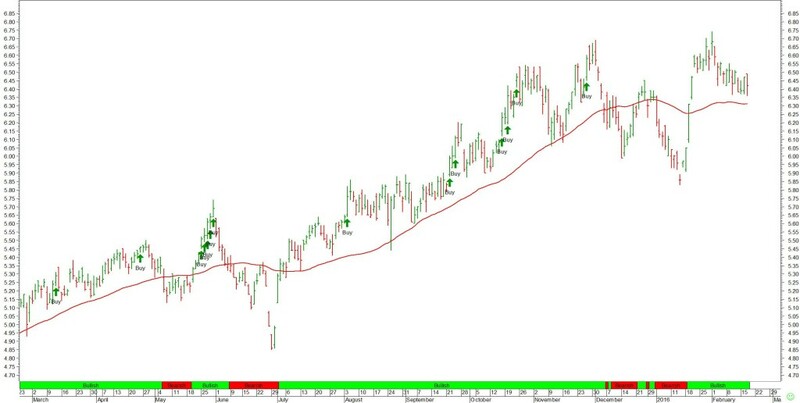 Notice on the chart below that there is now a trend ribbon, some Highlights and some Symbols labelled ‘Buy’. 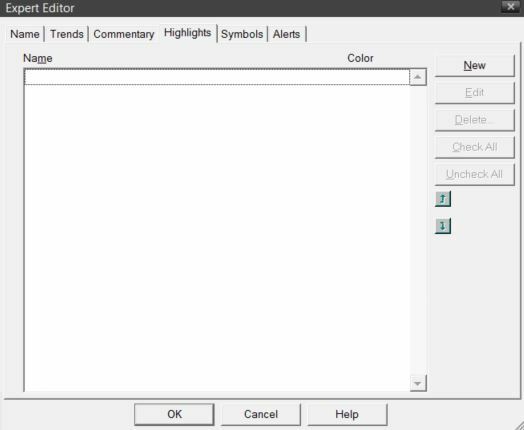 Within the ‘Expert Alert Editor’ dialog, there is also an ‘Alert’ tab next to the ‘Name’ tab. With this tab we can specify what action to take, should the condition be met. We can choose from three options: enter text, select a video or select an audio file. 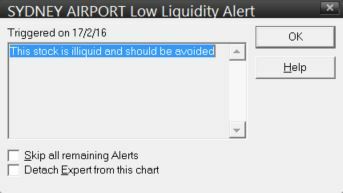 In our example, we are going to place a text Alert, thus write into the message box, “This stock is illiquid and should be avoided”. Once this information is entered, click ‘OK’ and we return to the main ‘Expert Editor’ dialog. 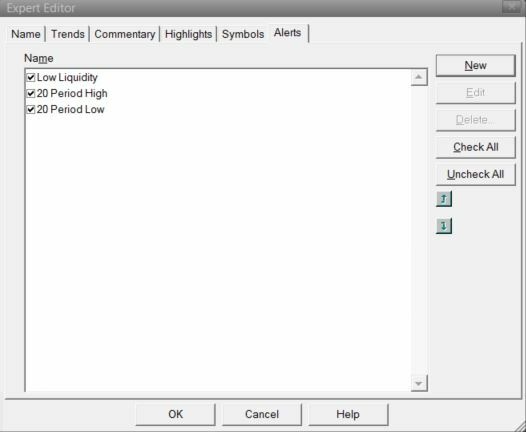 Similarly to the Highlights and Symbols sections we can create an infinite number of Alerts; however unlike the other components, if two Alerts are triggered for the same period then the Alert that ranks first will be shown first. That said, as soon as you close this Alert, the next applicable Alert will be shown. With so many options and possibilities to choose from, the Expert Advisor can be quite complex, however it’s well worth learning about. This is one of the little used gems within Metastock. So, load up The Expert Advisor, fiddle around and learn from the experience.